This entry was posted in Cat adoptions, cat behavior, Cat blogs, Cat writers, cats, Fear Free, kittens, Oliver, Olive, Three chatty cats, purrresidant, Kitty Cat Pawty, Pet blogging, politics, Presidential Race 2016, shelter cats and tagged cats and fireworks, cats and the Fourth of July, Friendly Friday Fill Ins, Kitty Cat Pawty, Oliver, Oliver for Purresident, Purresident. 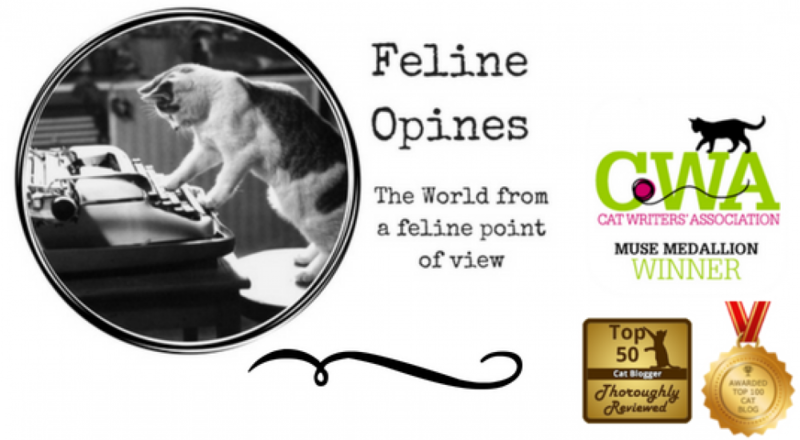 by Feline Opines. Bookmark the permalink. Thank you, I’m practicing my cute pose as the Male Human cleans the grill. 2. Favourite 4th July picnic food: Sa Majesté does le quatorze juillet instead, being French, & he is partial to a bit of jambon de Bayonne. 3. He begins every day by screaming himself senseless & waking us up. 4. His Cat Daddy is the best thing since sliced bread. MOL, “screaming himself senseless”! Our Alpha Tucker does the same thing but our Humans call it “singing the song of his people”. I think your description is far more accurate! Excellent answers! AND I hope you do run in 2020 – our world needs the good, sound guidance of a wise cat. Why thank you and if I do I’m hoping Olive will consider being my Vice Purresident again! I love all your answers, Alberto. I will vote for you, Oliver. Yes indeed. I don’t care for fireworks either and for he same reason you hate them. Hello, Lucy One White here.1. Fireworks are too loud. I go to sleep. 2. best picnic food grilled chicken or fish. I like beef, but it always comes back up, so my Moms don’t give it to me. They’re silly! 3. I start every day with my alarming routine, waking up the humans by yelling and doing step dancing on them. After that I have my pill dissolved in half and half, and then sit on a lap. 4. I like my birthday the most and will celebrate with the country. You can all come to my party. MOL We lives the step dancing! That’s what Jasmine does to the Female Human every night! Purrfect fill in answers Lucy One White! Thanks for your support Snoops & Kommando Kitty! Yum, I’m licking my chops in anticipation .